This is a slight variation on an extremely effective imitation of a cased caddis or sedge larva developed by Oliver Edwards. Trout and grayling both feed heavily at times on the larvae of various species of sedge. In the case of those larvae that build protective homes of sand, small stones etc, they will swallow them case and all. The Peeping Caddis is designed to imitate a cased sedge larva as it trundles along the riverbed. Often its body and legs will protrude well out of its case and it is this aspect that Oliver’s pattern imitates so well. By using a short length of pale yarn, singed to create a dark blob at one end, a simple but extremely lifelike impression of the body and head are created. The addition of long fibres from a partridge hackle completes the illusion, representing the insect’s legs and also adding some mobility to the fly. As the Peeping Caddis is designed to fish right on the riverbed, it is heavily weighted. Close turns of lead wire wound along the shank are added to, in the original, by a split shot connected near the eye of the hook by a loop of nylon. Here the only radical change is the substitution of a metal bead, slipped along the shank, for the shot. Tied with all this weight, the finished pattern sinks very quickly and also sits with the hook point slightly raised, helping to prevent it from snagging the bottom. 1. 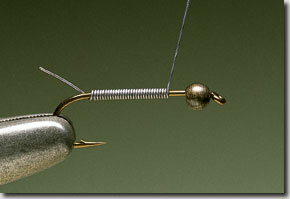 Before fixing the hook in the vice, slip on a 3 mm metal bead. This can be either the standard gold or black as shown here. 2. 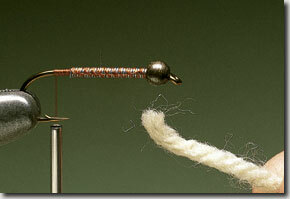 Take 3 in of medium-width lead wire and wind it along the shank in close turns. 3. Remove the excess then push the wire up into the recess at the base of the bead, leaving a short section of shank bare at the rear. Secure the lead wire in place with tying thread. 4. Carry the tying thread down to the bend before taking a short length of cream yarn. 5. Allow the end of the yarn to burn for a few seconds to form a blackened section at one end. 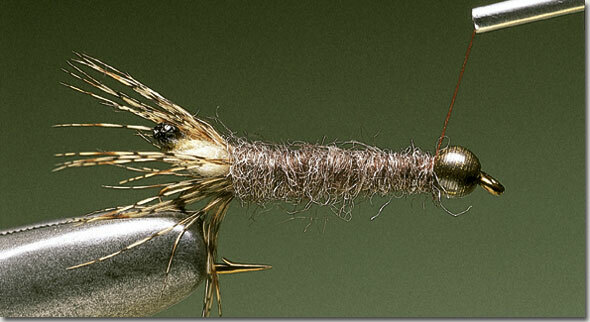 Catch the yarn in at the bend to suggest the peeping body of the caddis larva. 6. Fix the waste end of the yarn with thread so it fills the gap between the lead wire and the bend. 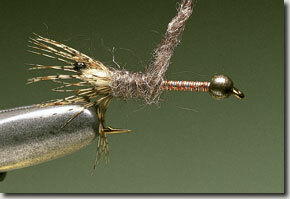 That done, catch in a long-fibred brown partridge hackle by its tip. 7. 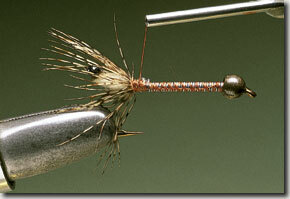 Take hold of the base of the partridge feather with hackle pliers and wind on two full turns. As each turn is made, stroke the fibres toward the hook bend. 8. Secure the base of the partridge hackle and remove the excess. Use a few turns of thread at the base of the hackle to ensure all the fibres maintain the correct position. 9. Take a length of grey sparkle yarn and tease out the fibres. Dub this on to the tying thread to form a thick rope. 10. Starting right at the base of the hackle, begin winding on the dubbed yarn. Carry it down toward the bead in close turns. 11. Continue winding the dubbing, right up to the base of the bead. Allowing the dubbing to spread from halfway along produces a slight taper to the body. Cast off the tying thread with a whip finish. The Peeping Caddis is an effective pattern on both chalkstreams and rainfed rivers. Works best in deeper pools and runs, especially where there is a good flow rate. Especially good for winkling out a fish from a deep pocket. A good pattern to try both early and late in the season especially when surface activity is nonexistent. Also good after a flood as the river is clearing but still running quite hard. Fished either singly or as the point fly with another nymph on the dropper. It should be cast well upstream to allow it plenty of time to sink to the bottom, especially when fishing deeper stretches. It should then be allowed to bump along the riverbed until it has drifted downstream of the angler. When producing the yarn body, allow the end to catch light for a few seconds before extinguishing the flame. This will produce a good-sized head. Also don’t use real wool because it won’t melt.